The CBC’s continued (and slightly ridiculous) hyperbole aside, this is not a list of the five “most essential” books of the decade. That list would see McKay, Fallis, Abdou & Lemire replaced with Hill, Boyden, Martel and Gibson. But thank goodness for that. This list, much more a product of grassroots advocacy and adventurous panelists, is more interesting than a list of “essentials” ever could have been. I get to read four books I’ve never read (I read – and loved – Essex County just recently) and three newbie novelists (and one very hard-working graphic novelist) get a kick at the Professional, Full-Time Novelist can. This list looks like any Canada Reads list from the last 10 years. Laraque & Abdou – Yikes! I’ll tell you straight, at the launch these two looked unbeatable. Both excellent speakers, making excellent points in Bone Cage‘s favour. What could beat them? Well, the book might not actually be any good. But then, I realized, to whom would that matter? For the first time, I don’t see any seriously “intellectual” faces on this Canada Reads panel. I suspect every last one of the five panelists is going to play a tactical or emotional game. Too bad for serious criticism, but I’m sure we’ll see some entertaining debate instead. Anne Giardini – Oh Dear. Any enthusiasm I might have had about reading Unless – which was mixed to begin with, as I loved Republic of Love but hated Stone Diaries – was nearly killed by Anne Giardini’s limp and bland “endorsement”. I spent her five minutes rolling my eyes at her “quintessentially Canadian” this and “emotional tour de force” that. Carol Sheilds wouldn’t have been so obsequious. Yuck. Probably the biggest news of all is that the final episode of Canada Reads will be taped live this year in front of an audience. This is, I’m sure, a wise reaction to some concerns raised last year at Book Camp T.O. and elsewhere that in the world of social media, taping the debates ahead of time and announcing the results on the radio long after cartons of the Canada Reads winner have been shipped to big box bookstores was bound to result, ultimately, in leaks. I love the idea that this year, we’ll all know the winner at the same time. On to the reading! I’ve put my orders through for my copies of the four books I lack. All that remains is to get them and to read them! Oh, and to continue to wait anxiously for Kerry Clare’s equally-anticipated (by me, anyway) announcement about her Canada Reads Independently 2011 panelists and books! Having heard a mere spoiler of what Kerry has in store for us, I feel I have reason to believe there will be several VERY interesting books chosen for this list too! As with last year, I’ll be reading both sets this year – that’s the kind of masochist I can be. Hope you’ll join me! I’ve decided to emerge from my den and make a rare trek out into the public for the Canada Reads 2011 launch tomorrow! Anybody else? I’d love to see some friendly or familiar faces. I’m hideously shy, so it’s not very likely I’d have the nerve to approach anyone under my own power – but please, if you see me lurking around the periphery (possibly snapping photos), do come up and say hi! Crossing my fingers for all 10 (well, 6 or 7 of them, anyway) of the top-10 authors! Aren’t those adorable? They’re Book Darts from Lee Valley Tools. I’ve been feeling under the weather for the last week or so; nausea, mostly, which has been making novel-reading a bit of a challenge. But like so many I’m a compulsive reader anyway, and this week I’ve been reading all the silly Christmas catalogues that have been coming to the house. My dad does all his shopping at Lee Valley so I have every reason to suspect there are Book Darts on my horizon, which would be amazing because I am an obsessive acquirer and user of book marks. I always leave a bookmark in a book I’ve finished reading, as a means of marking it “read” – as well as a way of dating when I read it. This creates a need for infinite “disposable” bookmarks in the house (most often our Bob Miller Book Room beauties). Every time there’s a Small Press Book Fair or a Word on the Street I come away with a bag almost entirely filled with bookmarks. And they get used. This doesn’t stop me from also acquiring quite a lot of good, reusable bookmarks. One of my favourites is from the Osborne Collection, a reproduction of the beautiful gilt-on-blue spine of The Book of Romance (image somewhat shamefully stolen from elsewhere on the internet). My boss once gifted me a bookmark featuring a monogrammed “C”, from Italy. As silly as it sounds I replace these bookmarks with a disposable one once I’ve finished a book. They also only get used for particular, appropriate books. I should get a prize for attention to detail – or maybe I should be institutionalized; whichever. My Italian “C” last saw use in the new translation of Orlando Furioso; the Book of Romance accompanied me through all three of Dumas’s Valois Romances. For Canadian books I use promo book marks for… Canadian books. I just used The Workhorsery‘s (lovely) promotional bookmark for Wilson’s Julian Comstock, and you know what? Having Workhorsery’s mission statement staring at me during all my reading for a week and a half actually did the promotional trick. I’m now so intrigued by them (and encouraged by their recent signing with LitDist for distribution) that I have every intention of buying both their books at the next Small Press Book Fair. It’s at the top of my shopping list. I once wanted to do a study of early bookmarks, a topic which falls under “ephemera” in book history. It never came to be, which is unfortunate because I’d turned up some unusually marked-books in my rummagings. There seems to be something more personal, sometimes, in how readers choose to mark, tag, annotate and adorn their books. I’d love to hear your own bookmark habits! Have a favourite? Avoid them entirely? Any – dare I ask – dog-earers out there? I’ve been tinkering with LibraryThing this morning because it strikes me as a tool made for people like me. Actually, I got an email almost exactly a year ago from Library Thing’s founder Tim Spalding offering to move heaven and earth to get me to use the service, so apparently I’m not the only one who thinks it’s the Tool For Me. After a couple hours of data entry and flailing, however, I am bewildered. I’m still not clear what I should be doing with it. I thought once I had all my books listed some kind of use or purpose might become clear, but when I ran into the 200-book limit of the free account I gave up and bailed. Even the few books listed so far look wrong to me, like books I don’t own with only the most symbolic relevance to my actual shelves. I’m sure this is something that can be fixed with effort as I clean up ISBNs and covers, but there’s more to it than that. I think my “collection” might be too much of a mess to catalogue like this, or maybe just my collecting habits (which do, yes, run towards hoarding). Certainly my shelving and sorting regime is eccentric. 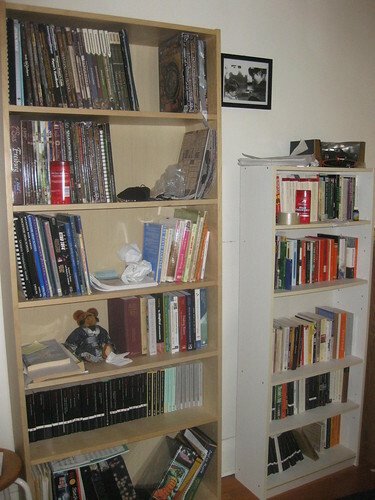 It isn’t messy (well, okay, it is) or disorganized, in fact I’ve got every last book shelves exactly where I want it. Sub-collections, groupings and pairings mean a lot to me. But there’s a gradient, a volatility, a flexibility I enjoy that makes labeling difficult. I moved three months ago from a place I’d lived in for five solid years to a bigger, much more book-friendly space. To this day I have not unpacked several boxes of books because I can’t decide where to put them. Until exactly the right placing presents itself, I’d sooner keep them in boxes. But enough of the words. 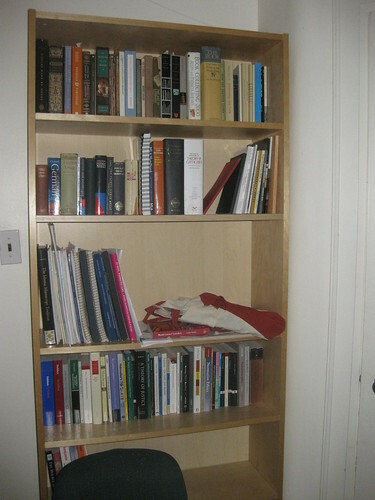 If the internet has taught us nothing else, it has revealed that bookshelves are better seen than described. Mine aren’t works of art (I’m aesthetically and artistically barren), but I feel they explain my collection better than LibraryThing can. This is a typical Charlotte’s Book Shelf. A disaster, yes. But look closer. 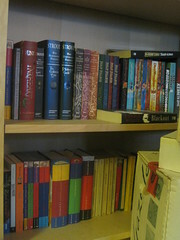 In fact, the shelf houses several sub-collections. The top is Old Valuable Books of No Particular Subject (including a 6-volume Oxford Illustrated Jane Austen and a 1st edition Once and Future King by T.H. White in dust jacket). 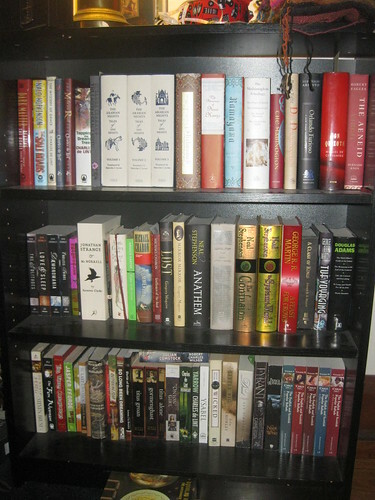 Next, pictured here (left), is Canadian Literature, Trade Paperbacks – which is to say, minus hardcovers and mass market editions (which are grouped elsewhere). Below that we have Contemporary Literature, Trade Paperbacks stacked in front of (and quite obscuring) Literary Non-Fiction, Paperbacks (below). Are you still with me? Good. Further ’round the room things got more complicated. I have one entire bookcase devoted to hardcovers, and I’m still not clear exactly how to order them, so I went with the unusual tactic of shelving by preference. 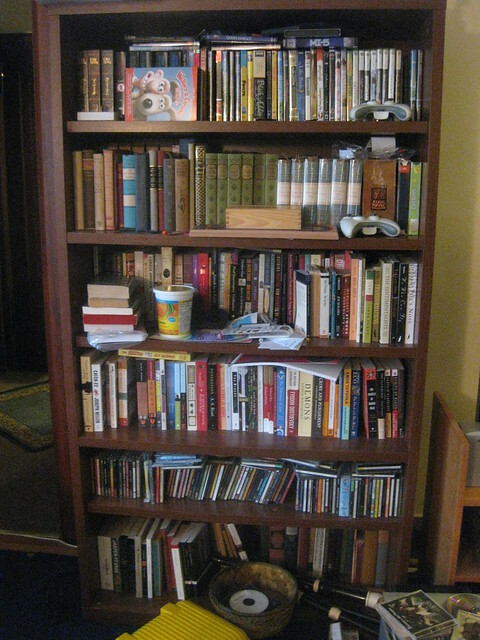 That is, my Favourite Hardcover Novels are on top, followed by my Favourite Hardcover Non-Fiction Titles (including my becoming-unwieldy sub-collection of Robertson Davies reference works). Below that we have Assorted Books On Magic Which Are Too Big To Shelve Alsewhere (including Plato’s Complete Works and a Shorter Oxford English Dictionary – not strictly books on the occult, but if you think creatively enough it fits), and taller pieces of my husband’s Tolkien collection, which continues on the next shelf. 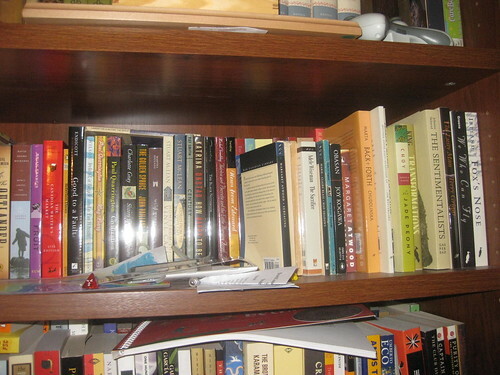 A note on my husband’s books: he doesn’t have many. When we started dating I made it clear I was a book collector, but I don’t think he realized he the gravity of the situation until we moved in together and he found he was moving into a library. Whatever impulses he might have had to buy books were quickly and firmly quashed by pragmatism. Who needs to buy books when you live in a library? It would be cheaper this way. To his credit, he has not (yet) become a spouse who demands the collection be culled. Much. 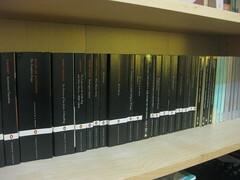 My collection of Alexandre Dumas is actually much less well-ordered than you’d think. It had the misfortune of being unloaded next to the computer, and next-to-the-computer detritus inevitably joined my little Musketeers and Cardinal’s Men up there. 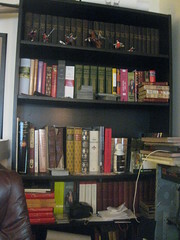 Note that the Works of Alexandre Dumas in 30 volumes fits exactly on the top shelf. Poor, ransacked Young Adult Literature! The Young Adult Literature, on the other hand, came together just fine. Of course, half of it seems to be missing. What does this say about my friends and family that this is what is most frequently borrowed from my shelves? I am a big one for “prioritizing” my books. Not, like a smart lady, in terms of “read” and “unread”, but in terms of “to be shown off” and “to be hidden”. I acquire quite a lot of free books in the form of damaged discards, promos and garage sale finds which I take without discrimination, reasoning that I might need them some day, or you never know when something will come in handy. On the other hand, I don’t really want to display copies of, say, Atlas Shrugged, beat up old editions of Augustine and Defoe, Environmental Studies textbooks, or somewhat dogmatic analyses of current events like It’s the Crude, Dude or God Is Not Great. These go on bottom shelves, or are hidden in my bedroom. The Shelves of Shame include the Role Playing Books. These are hardly all the Penguins, but are cute together nonetheless. But, find an empty bookshelf and find some books to fill it – if my house were a bookstore, we’d also call this “overstock”. So much of this stuff is books I just don’t know what to do with. In a fit of frustration, I started shelving these by publisher. I also discovered, to my dismay, that I have no fewer than three full shelves of back-issues of magazines – old Walruses and National Geographics mainly – things which shelve poorly and were relegated to the Shelves of Shame for their lack of spine. Sadly, this is also where my old, beat-up mass market Canadian books are. Not that they are objects of shame, but mass market editions fit poorly onto Billy bookshelves, which offer so much vertical space that they’re best filled with the taller trade paperbacks and hardcovers. Ah, the office. Moving into the new house we harboured a fantasy that we’d have time to lock ourselves away and work on our respective intellectual pursuits. Ha! Maybe in another two years, when the 2-year-old doesn’t regard a closed door as a mortal offense. 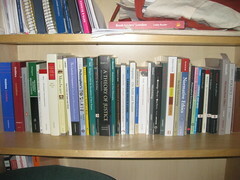 Still, I like to think my Book History collection and my husband’s Philosophy books look nice all together. Now don’t be misled by all the empty space. 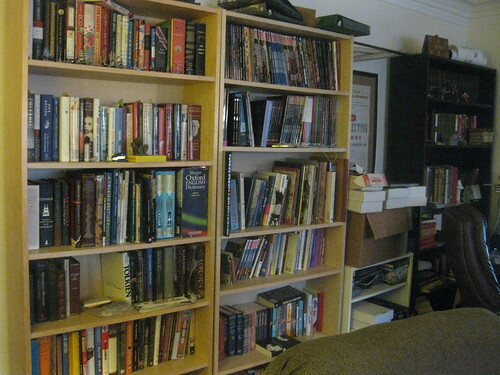 I’ve boxes and boxes of books left to unpack – but I’m paralyzed with indecision right now. I don’t know where to put my piles of mass market fantasy books – they can’t very well be shelved next to Philosophy or in the the Nabokov. And surely there’s a better use of my office shelves than unloading the remaining damaged and garage-saled miscellany into it? And I tell you I don’t know where I’m going to put this 3-Volume Autobiography of Mark Twain when I get it home – it needs a shelf unto itself. Anyway, it’s not all a giant mess. 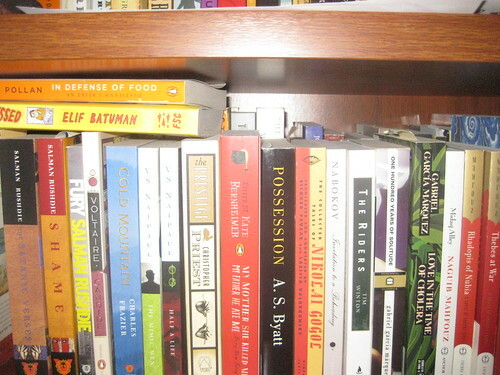 I have at least one nice, reasonably well-organized shelf. I’d better not add anything to the collection though, I’m plum out of space. 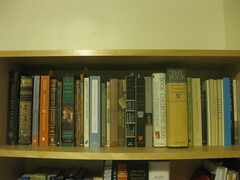 I’ve been working on a collection on The Intellectual Roots of Speculative Fiction, and this is much of it. Myths, legends, epics, retellings and early fantasies – these go here. As more arrive the contemporary genre titles get shuffled away (into oblivion – they don’t have a home yet). That’s the way of my sorting. Placeholders, like-titles, reclassified as space requires. There’s no hard-and-fast rules. I keep Crowley’s Little, Big with this History of Fantasy stuff, along side Lord Dunsany and The Worm Ouroboros. But Nalo Hopkinson and Charles de Lint will have to move on eventually – exactly why I couldn’t tell you, but they don’t belong, just yet. I tired to denote this with overlapping categories on Library Thing, but every time I moved a book I felt pressure to change all the categories. With several thousand titles, I think this could start to become ridiculous. So I’m out, Library Thing. I tried. I’m either too organized or not organized enough for you! But thank you, and I will enjoy browsing other peoples’ libraries for the time being. Oh, and if you’re curious – you can view my minimal Library Thing profile here. Maybe you can spot what I’m doing wrong? Meanwhile, I hope you enjoyed my more meandering tour! … I’m renovating. I needed a WordPress theme with a wider text column, and so now we’re working out the nitty-gritty of all these other customizables. Apologies! I hope you will all excuse me a personal, someone saccharine post. It does run bookish, eventually. I’ve had a rough couple of months, in truth. Those of you with children will understand: kids at the younger end of the spectrum sometimes go through phases (weeks, months, years) that force a mother to suspend her own well-being for a while. Sleep and peace of mind are the two biggest casualties, though don’t consider this a complaint. They are freely sacrificed. I might be incoherent and incapable of following an idea through to its logical conclusion, but that’s small potatoes in the wide world of well-being, mental health and safety. Miss Margaret, in a rare book-free moment. 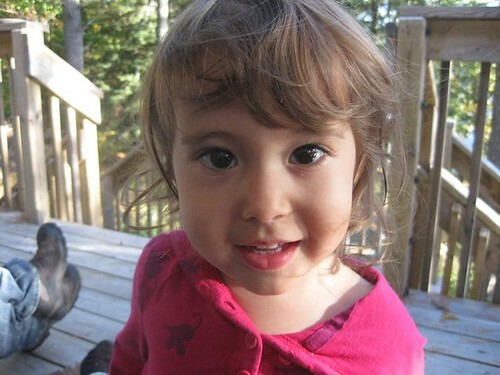 My daughter, Miss Margaret, has been attending daycare full-time since the beginning of September. She was barely 2 years old when she began, and she’s 28 months old now. Like it is for so many little kids, the transition was rough. Though she enjoyed her first week, once she recognized this was to be a regular thing the resistance began. The Screaming Meltdowns began, the tears and the clinging and the begging for “one more hug, just one more hug!” at drop off. We were told to expect a couple of weeks of this. After 6 weeks of this we wondered if something was up – not only did the Screaming Meltdowns show no sign of abating, but daycare has become a taboo subject around our house. “No! No! Nuffin’!” She yells at me when I ask her how her day was. “Nuffin’ about daycare!” She refuses, at daycare, to take any of her outdoor clothes off, or put any of her belongings away. She needs them, she says, for when Mama comes back. I find out how her day was through play. I might catch her sending one of her dolls “to the baby room” when the doll yells too much. She has elaborate conversations on her fake cellphone about which kids bit her and which kids hit her. Once or twice, just before drifting off to sleep at night, she has whispered something to me like “Mama, my friends at daycare not have words.” She has never said a positive thing about the place, ever. It has been suggested that the problem is me, that I have a “negative attitude” towards the place and Maggie “picks up” on my vibes. I disguise my opinions on the matter as best as I can, hype the place up and approach it smiling each day, but meanwhile she has become more devious in avoiding it. “Okay, Mama.” she said, resigned, one day. “I come to work with you. I work at Bob Miller.” Nice try kid. This morning: “Mama, when I start school? I go big kids room today?” “It’s the weekend!” she announced, smiling, on Wednesday. Over the last four months she has lost much of the independence we’d gained up to that point. She will no longer sleep by herself. She wakes up screaming things like “No! Not take my hat off! I want my mom!” She started wetting the bed. Well, you know, these are some toxic vibes I give off. In any case, Maggie spends 9 hours a day, 5 days a week in daycare, so I do my best on weekends to make up for it. Two full, luxurious days of family time. One of the issues with the daycare seems to be that Maggie isn’t a baby anymore, unlike many of the other kids. They don’t talk yet (much); Maggie does nothing but talk. They have a brief story-time, but the books are single-sentence board-books, compared to the long form picture books (Curious George Flies a Kite and Library Lion are this week’s faves) and short chapter books (Burgess’s Adventures of Jimmy Skunk and Winnie the Pooh are happily preferred) we read at home. They don’t do many structured activities, though “art” like gluing feathers to paper plates finds its way into her cubby-hole at the end of each day. She wants interactive, stimulating, challenging activities with the non-hitting, non-biting, non-grabbing safety of her mom. I want to bring her to the museum and the art gallery, to puppet shows and plays. I want to bring her to concerts and demonstrations and readings. I want to expose her every day to the wealth and variety of cultural life available here in Toronto. But time is so short, and so rushed. Two days. Two days minus naps, the urgent, oft-neglected housekeeping and family obligations. In the end we’re lucky if we can manage one activity a weekend, and often it feels forced and cut short. It takes her a full day to “unwind” from the stress of the week and to really relax enough to enjoy herself. Art, and cultural education, is supposed to be a foundation of a good liberal, Humanistic society. Maggie is younger then one might usually worry about introducing those things to a kid, but she’s clearly ready and enjoys it when rarely we fit it into our lives. Do I hope these values will be instilled by the institutions I’ve already committed her to? Will there be a natural bridge from the campy CDs played in the background at daycare to the knowledge of what a violin is, and a desire to play one? Will they take her to the theatre? Will they teach her to dance? At the end of every day Maggie starts pulling books off the shelf and piling them next to me. I always swore I’d read to her as much as she liked, until I realized she’d listen for hours each day if I had the voice for it. Now we bargain, like Olivia and her mother from Ian Falconer’s eponymous books. Five books, maybe six. Okay, one more. We are heavy library users, withdrawing ten new books every three weeks like clockwork. The library is a fixture of our lives. This, at least, I can do: the books are there, and need no tickets, travel or preparation to enjoy. For Maggie the appeal of the book is as much the chance to reconnect with mommy and daddy through the hours spent curled up on our laps, warm and comforted, as it is the story. However miserable our days have been, everything stops when we settle in to read. Her anxiety and crankiness melts away, as does mine. We read, talk the book over, bargain over what to read next, move on. I don’t know if this makes up for what we’re missing out on. I envy stay-at-home moms violently. But it is what I have to offer. The realities of our life have whittled the ideal down to this: there is a huge, varied, diverse world of ideas and sensations out there, and we can glimpse it through books. Whatever else we can’t find time for, there is always time for reading, and for that I am very, deeply grateful. To all the other things I love about books, you can add this to the top of the list in big, boldface type. They are the very best gift I can give my daughter.